I went there twice with reservation. Both times, i waited 30 min infront of the door. I think they are really disappointing. Food was great and big servings. Wish I came with an empty stomach. Would definitely go back again. Friendly lady at the bar gave us some housemade frozen margaritas and served us well throughout our stay. I love the fact they have Stella Artois from the draft! Always delicious and the real flavour from Mexico. Nice atmosphere and good service is worthy . Original drinks that brings memories from Mexico. Love this place - returned to Amsterdam for a second trip and this restaurant was our first port of call. Food excellent and drinks amazing. Great Food! Nice service. The Music a bit too loud for my taste. Mediocre food, poor service, loud, tiny, cramped. Tables are jammed together; my friend and I could barely move in our chairs. Cocktails were ok though. Most lovable place of Amsterdam. Honest mexican food. Enchilada de Mole is best stuff i ever had. Slow service, less than average food, disappointing drinks. 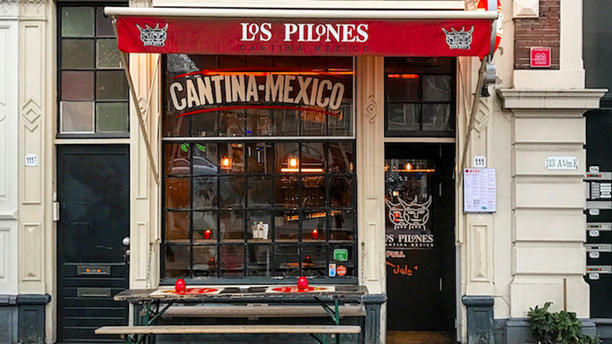 For as long as I've lived in Amsterdam (>4 years) I have complained there is no good Mexican food here. I followed a tip to come here and honestly it was the best Mexican food I've had outside Mexico. The tacos were, well for starters they were actually tacos, which is pretty rare in Amsterdam! But not only than this, they were really good, best in town by a country mile. The tortilla chips were real tortilla chips, instead of the Doritos you'll get at most places. Nice selection of Mexican beers too. The quality of the food is getting worse and worse at Los Pilones, something I've noticed in the 14 years I've lived here. It really is a shame. I had the green cheese enchiladas. What slop! Looked like soup, struggled to find the actual corn tortilla. Kids were happy with the choriqueso (of course). Friends had tacos and alambre. Again, what a mishmash. Service was incredibly indifferent, no smile to be seen and no helpful information. The best thing is their drinks. The service was great. Unfortunately, the food did not correspond to the great and cosy ambience. Something was missing. Service was a little scatty. We’d booked online and they’d no record of it but welcomed us in anyway which was just as well as we were a party of 8. Saying that it was only 6pm. That aside the food was really good and the frozen margaritas absolutely excellent. Really good value - we’d go back. We were very much looking forward visiting this restaurant, bu unfortunately the experience was disappointing.